Google has kept quite on the subject of Chrome OS since its initial announcement in July of this year, but apparently, an unstable version of Google Chrome OS Browser from Google Chrome OS Build 28902 has been leaked by Jonathan Frederickson of Living in a Google World, and is now available for download. The version number of the leaked browser in question is 4.0.222.6 which is an integral part of Chrome OS Build 28902. 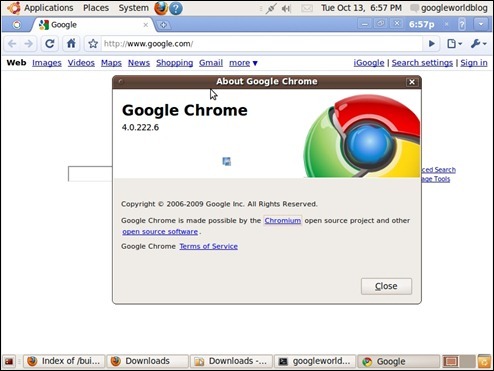 You will need to download and install a distro of Linux in order to try out Chrome OS Browser. Google Chrome OS Browser version 4.0.222.6 from Google Chrome OS Build 28902 can be download from here. 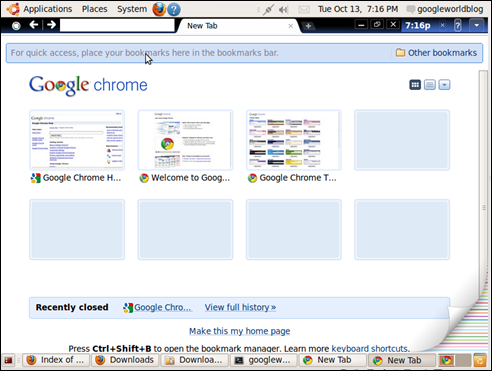 So the ubuntu taskbar on the top of the screenshot and the botton of the screenshot is't part of the Google Chrome OS?? if it is, how come there is firefox? ack, why it has ubuntu logo in start menu???!!! He's running the build made for chrome os in ubuntu. This is possible since chrome os is linux and so is ubuntu. 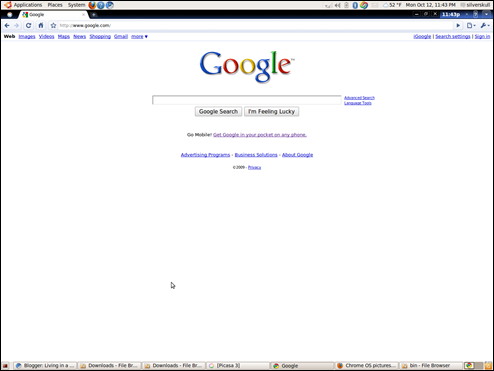 it´s just the webbrowser from chrome for ubuntu. the real chrome doesn´t run in debianlike systems. the grub for the sys and the bootaction would make it pretty slow. it will run in a standalone where the grub is the system itself. check http://www.youtube.com/watch?v=ANMrzw7JFzA for the demo the google team gave!